Clear glass, brass cap, gas filled, Properly prefocused. Tested at every stage of production to assure the quality. Body: (As Per Customers' Designs & Specifications), Etc. We stand as one of the leading suppliers of Miniature Lamp for which we have a dedication section. We provide one of the best quality miniature lamps as per customer specific requirements. We use sophisticated technology and army of qualified engineers and technicians, who ensures supreme quality and international standard of our products. We supply Midget, Grooved Midget Lamp, Wage Lamp, Module Lamp, Telephone Lamp, H-Lamp, Fastoon Lamp, MCC Lamp, BA9'S Lamp, E-10 Lamp, E-12 Lamp, E-14 Lamp, E-27 Lamp, SBC Lamp, B-22 D Lamp, Candle Lamp, Pigmy Lamp, Ball Lamp, Tubilar Lamp, Auto Lamp, Etc. We are known as the specialists in the trading of Miniature Lamps. Miniature Lamps from Bosch are a reliable choice for various automotive applications such as indicators, dashboard lamps, speedometers etc. 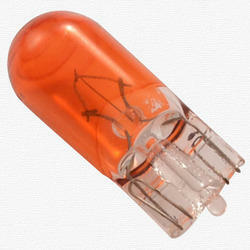 The imported filament in these bulbs provides longer life in addition to outstanding efficiency. These bulbs are suited for most 2 wheeler and Passenger car. We are engaged in offering high quality of Miniature Lamps. GAYATRI HOUSE manufactures Medical Miniature Bulbs / Lamps of high intensity, infrared emitters, used for medical applications requiring specific bulb size, base, and voltage. Our medical miniature bulbs are used for laryngoscope, diagnostic equipments / instruments, ophthalmoscope, Otoscope, fiber optics, aeroscope, ENT, etc.